If you'd like to push your high-end achievers, this is for you! When teaching 3rd, 4th, 5th, or 6th grade, Spelling is a subject that is great to differentiate. One way to do that for me is by assigning additional words from the list for certain students; I also would allow others to opt-in to this program. 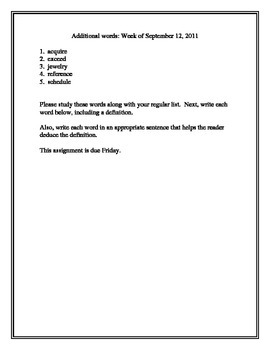 The students would be assessed on their other list, too, but these words would be added at the conclusion and scored as enrichment (for rewards, bonus, etc.). If a student wanted to opt-in to this program, I would allow them with parent permission, but they would have to remain in for half of the Report Period.